Using a scientifically illiterate liberal propaganda rag like 'thinkprogress' or 'ecowatch' as actual "evidence". Maybe for your next trick you can get a colonoscopy from Dr. Pepper? Randall, I hope you update this chart every year and post it on your website. I have been fascinated by it ever since you posted it. I have gone back many times since then to look at it, and have showed it to many other people. I would like to know where you got the data since some people I have showed it to have doubted it and need the facts. bfrg1513 wrote: Randall, I hope you update this chart every year and post it on your website. I have been fascinated by it ever since you posted it. I have gone back many times since then to look at it, and have showed it to many other people. I would like to know where you got the data since some people I have showed it to have doubted it and need the facts. Shakun (2012), Markutt(2013), Annan & Hargreaves (2013). I was surprised at the very conservative estimate of dog domestication, but you acknowledge that. Even though you don't explicitly say so, you give the impression that the bow and arrow was invented around 20K years ago, but the last thing I read was that there was pretty conclusive evidence which pushes that date back to some sixty thousand years ago. I was also interested in the astronomical science, but I am not up to date on the latest theories. However, I was surprised you pointed out changes in the Earth's orbit (are you talking about precession or something else?) but made no mention of solar weather. I would expect that outside of life activities, changes in solar weather would be a more important variable than changes in the Earth's orbit. Every time I bring up solar weather in the history of climate change, people automatically assume I am a denier of anthropogenic climate change. Of course I'm not. That's just stupid. I mean, forget about our out of control population and our internal combustion engines. What do you think is going to happen if you cut down all the trees? We were well on our way down this path by the Roman era. I hate to even have to say this, but if I don't, I know I'll get slapped with that label. andturn wrote: ... of solar weather. The variability of the Sun's output is wavelength dependent; different wavelengths have higher variability than others. Most of the energy from the Sun is emitted in the visible wavelengths (approximately 400 – 800 nanometers (nm)). The output from the sun in these wavelengths is nearly constant and changes by only one part in a thousand (0.1%) over the course of the 11-year solar cycle. At Ultraviolet or UV wavelengths (120 – 400 nm), the solar irradiance variability is larger over the course of the solar cycle, with changes up to 15%. This has a significant impact on the absorption of energy by ozone and in the stratosphere. At shorter wavelengths, like the Extreme Ultraviolet (EUV), the Sun changes by 30% - 300% over very short timescales (i.e. minutes). These wavelengths are absorbed in the upper atmosphere so they have minimal impact on the climate of Earth. At the other end of the light spectrum, at Infrared (IR) wavelengths (800 – 10,000 nm), the Sun is very stable and only changes by a percent or less over the solar cycle. The total wavelength-integrated energy from sunlight is referred to as the Total Solar Irradiance (TSI). It is measured from satellites to be about 1365.5 Watts/m2 at solar minimum to 1366.5 Watts/m2 at solar maximum. An increase of 0.1% in the TSI represents about 1.3 Watts/m2 change in energy input at the top of the atmosphere. 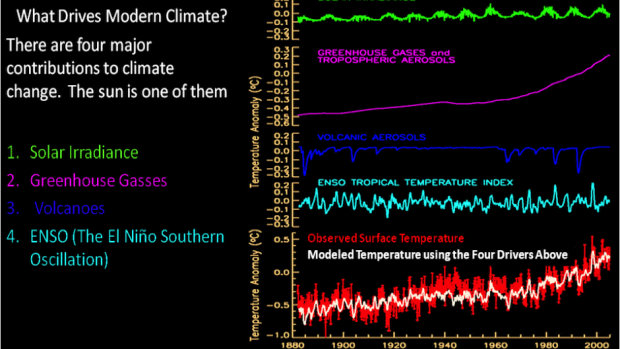 This energy is scattered, reflected, and absorbed at various altitudes in the atmosphere, but the resulting change in the temperature of the atmosphere is measurable. It should be noted that the change in climate due to solar variability is likely small, but more research needs to be done. The duration of solar minimum may also have an impact on Earth's climate. During solar minimum there is a maximum in the amount of Cosmic rays, high energy particles whose source is outside our Solar system, reaching earth. There is a theory that cosmic rays can create nucleation sites in the atmosphere which seed cloud formation and create cloudier conditions. If this were true, then there would be a significant impact on climate, which would be modulated by the 11-year solar cycle. Pretty steady 11-year cycle. Back in 1970, it was the recent deviation from the sum of many well-established cycles that made global warming evident. That solar cycle was among them. rmsgrey wrote: The gas cookers I've interacted with have been 100% gas for heating (gas oven, gas hobs, gas grill) but use electric-sparks to ignite the gas. Why? Because gas is a cheaper heat source than electricity (at least in marginal cost) - which is also why we use gas for our central heating rather than electricity, though our boiler is also hooked up to mains power. Yes, why burn the gas far away to produce electricity and then use the electricity to produce heat when you can get better efficiency by burning the gas for heat directly? There'd be a balance against economies of scale... And you're needing electricity for other reasons. Maybe a CHP unit under your stairs (or wherever makes sense in your particular house-plan) would be better. Or maybe a neighbourhood midi power-plant (with good quality waste incineration and/or biogas elements, maybe) supplying District Heating? Each has their benefits and otherwise. ijuin wrote: Yes, why burn the gas far away to produce electricity and then use the electricity to produce heat when you can get better efficiency by burning the gas for heat directly? An obvious potential reason is because it's easier to use the infrastructure already in place to distribute electricity that you're using for other purposes than to create additional infrastructure to distribute gas. Like most utilities, the initial creation of the required infrastructure provides a barrier to adoption. Heat pumps are also an option, and they use much less energy than direct heating for the same reason refrigeration takes less energy. Generally you are able to move more than 2 units of heat for every 1 unit of energy, whether supplied by gas or electricity (but usually it's electric). Again, the downside is the cost of building the system, but at least here there is no external infrastructure beyond the house itself (you don't have to pump in natural gas). And it isn't always worth it, particularly if it is extremely cold outside. But I'm still surprised we don't see more of these around. In general, yes (well, it's actually a 22-year cycle to get back to its original polarity), but we have the historic example of the Maunder minimum which reminds us that solar weather is quite chaotic—a rubber band ball of magnetic fields bouncing off and crashing into each other. I would also note the history of scientific solar observation (let's call it about 2000 years based on Chinese sunspot observations) is extremely short in the life of a star. It is a big assumption that the Sun has been ticking away at that rhythm for tens of thousands of years. The solar dynamo might have other stable modes of oscillation. That is all true and interesting, but to be clear with respect to the comic itself, those variations still are both small and almost 180 degrees out of synch with the current observed warming. Just in case anyone discovers this thread in the future and spins your post as supporting the denialist position. Great info! Do we know, out of these 4 contributors to global warming, what weight do each of them carry? The focus in the general public has been on carbon dioxide emissions. rayran7545 wrote: Great info! Do we know, out of these 4 contributors to global warming, what weight do each of them carry? The focus in the general public has been on carbon dioxide emissions. Some of these are factors are getting multiplied together, so you can't describe one as "mattering more" the way you can in a linear combination like a weighted average. But we can talk about the causes of various periods of sudden warming or cooling and the comparative impact in changes in forcing and sensitivity that led to them. In the current period of warming, solar irradiance has been fairly steady and even dropped slightly over the past few decades, while forcing has risen precipitously mostly due to the increase in carbon dioxide concentration. This has happened in spite of the increase in aerosol pollution that should reduce forcing, as the effect of carbon dioxide completely overwhelms it. The graph is fascinating and in FAR more detail than anything I have encountered before. What is the source of such accurate data? PTHirth wrote: The graph is fascinating and in FAR more detail than anything I have encountered before. What is the source of such accurate data? the sources are mentioned on the side of the graphic. Hi. It's 2019. Time for an update to my effortpost a while back. After the recent El Nino event of 2015-16, it's clear that the microwave remote sensing measurements of the lower troposphere--represented by the RSS and UAH6.0 datasets, have about caught up with the direct measurements from weather stations, even if they're still a bit lower. In fact, it's pretty unequivocal that there is no 'pause', with all five datasets (now with BEST land/ocean) indicating a global temperature rise of at least 0.12 K/decade. Good question there. 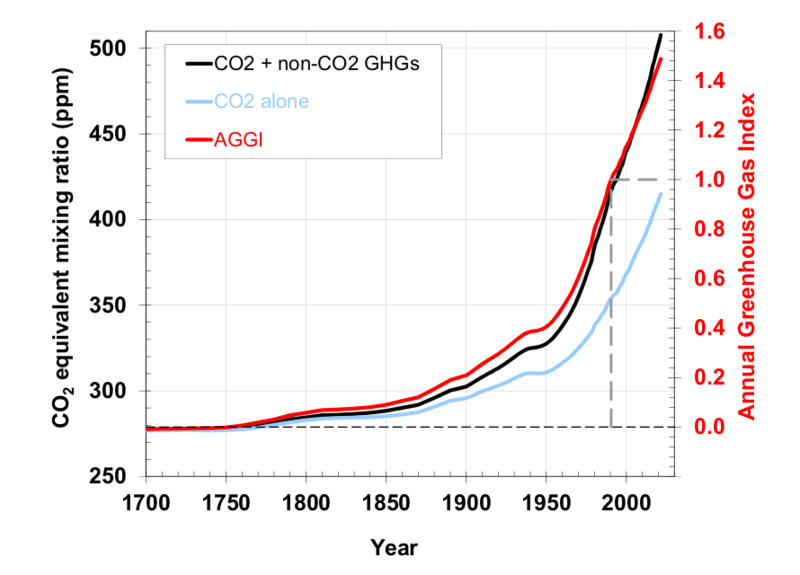 The IPCC has thankfully graphed that. As you can see, the solar component has an amplitude of about 0.1 K on an 11-year cycle or so, with it currently being a negative forcing due to the weak solar maxima post-2000 (yes, sunspots are darker, but they are surrounded by brighter regions, hence total irradiance increases). The volcanic aerosol component is irregular and usually short-term, with again an amplitude of about -0.2 K for 3 to 5 years. Internal climate cycles--most notably El Nino--raise or lower the temperature by about 0.3 K on a yearly basis, occasionally. Longer-term cycles have a much smaller effect. The remaining elephant in the room, is of course anthropogenic. This can itself be divided into two forcings--i) the GHG forcing from primarily carbon dioxide, but also methane and chloroflourocarbons, which is positive, and ii) the forcing from aerosols like black carbon in the upper troposphere and stratosphere, which reflect solar radiation (the direct effect), and also form clouds (the indirect effect); these both act to cause global cooling, which is weaker than the warming from greenhouse gases directly. (In fact, the slower upward trend around 1970 or so was during a time when a great deal of soot was emitted into the atmosphere relative to carbon dioxide.) This second factor is very hard to estimate, and accounts for a large portion of the uncertainty in future climate change projections, but taken together, we clearly see that anthropogenic causes contribute the vast majority of the observed global warming. In any case, a much more detailed discussion of solar forcing etc. is available at skeptical science. Is the CFC contribution significant? This is actually an interesting topic I haven't had the chance to look into. I have heard that HCFCs with more limited (or no) impact on the ozone layer have a greater impact as GHGs than perhalogenated molecules like dichlorodifluoromethane. This would put halogenated hydrocarbons on a continuum between maximally halogenated and minimally greenhouse (but maximally ozone-depleting) to pure hydrocarbons and maximum greenhouse (but non-ozone-depleting). Not really; currently, CFC-12 and CFC-11 contribute the majority of the fluorocarbon-induced radiative forcing (which is about, say, 10% of the total), according to NOAA ; the '15 minor components' are primarily the other HFCs you mentioned. CFC-12 (dichlorodifluoromethane) remains solidly in the lead even as its concentration is declining slowly. Maybe as the HFC concentration catches up this might even out a bit. Wikipedia says difluoromethane has no risk to the ozone layer and only half the global warming potential of dichlorodifluoromethane. But from what I see it looks like the range is too large to say anything meaningful. CFCs range from 4,500 to 14,000, HCFCs range from 80 to 2,000, and HFCs range from 4 to 12,500. So clearly it depends which one you pick.